"Some years afterwards, in 1881, I found out the secret. A man who did not know that it was I who had conducted the Orissa rice contract, told me as a good joke how he, in partnership with some others, chief of whom was as scoundrel called K- (then an Assistant Secretary to the Government), had secured a contract from the Government for the supply of a large quantity of Burmah rice and how, before the contract was signed, they had been alarmed by the news that someone down in Orissa had offered to supply a very large quantity of rice at a cheaper rate, and that the famine officer in Calcutta, Toynbee, having served for many years in Orissa was trying to favour the Orissa merchants and induce Government to accept their offer. Then came the news that Toynbee had succeeded, principally owing to the dislike of Burmah rice by the Bengalis. K- , my informant said, took advantage of his position to suggest to Government that it would not be safe to rely upon the Orissa contractors sending the rice in their own vessels, as they would not be able to find vessels enough. He thus procured the issue of the order...and...he and his partners brought all their Burmah rice to Calcutta and disposed of it to the Government." The Orissa Famine served as a wake-up call to the British Government, who managed the subsequent "famine in Behar and Northern Bengal" with care and "made all the needful arrangements". More than 150 years have passed. 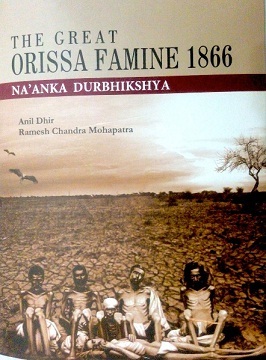 'THE GREAT ORISSA FAMINE 1866' - 'NA'ANKA DURBHIKSHYA' book in English was released last year in a function in Bhubaneswar. It is based on the available reports of British Govt. and media.